Do people tell you that you're a natural when it comes to decorating? Do you have an eye for detail? Do you want a way to make money that involves more than just sitting at a computer? Then you might consider starting a home staging business! A home stager or home staging professional — sometimes just called a stager — is someone who prepares a home for sale by selecting furniture and accessories that will appeal to buyers. Even though these items are almost never sold along with a home, they can make the atmosphere more attractive, sometimes leading to a quick sale. A stager is hired as a third party to objectively decorate the home. Many sellers have lived in their homes too long and too comfortably, making it difficult for them to be objective about how the home looks. Sellers are often not able to psychologically detach themselves from their homes enough to make changes on their own that are more appealing. A good home stager will try to help potential buyers see themselves as living in the home. Many times a stager will try to go more for an “overall look”, so that too much of a current owner's personality will not show. In other words, that deer head on the wall will have to be removed, so that the “hunting enthusiast” personality of the current owner will not be seen. Knowledge of the marketing demographics of the area. As you may know, buyers often attempt to get sellers to lower prices based on a home's age or depreciation values. But a good stager can do a lot to make an aging home more appealing and updated so this is not as much of an issue. Which Types of Professionals or Personalities Tend to Become Stagers? Former realtors, home appraisers, window dressers, interior designers, and other professional people with an eye for design and an entrepreneurial mindset tend to gravitate towards becoming stagers. Creative types may also enjoy the challenges of working in the staging industry. What Equipment Do You Need to Become a Stager? Unlike a lot of work-at-home opportunities, starting a home staging business may require decent credit. Why? Because it's likely you'll need to buy or rent furniture and collect your own props (glass figures, flower vases, etc.). These things can be pricey and you may not initially have the overhead to attain them, so charging may be necessary. Additionally, you might have to pay furniture movers and for a spot to store the furniture/props you do begin collecting. Keep in mind that all of these additional expenses can be worked into your rates. How Much Can You Expect to Make as a Stager? You can see on Thumbtack that home stagers listed there vary in cost from $500 to $1500 per job. Debra Gould of Staging Diva indicates in her blog post on how much you can make as a stager that charging $75 to $200 an hour isn't unreasonable at all. What Special Training Will You Need to Become a Stager? You do not have to get certified to become a stager because it's not a regulated field. But as with all professions, having that certification will help bring in better income along with giving you more credibility. Definitely review these sites and any others you find before deciding if certification is worth the trouble and cost. You may also consider an interior design school, or check to see if your local community college offers interior design courses. Again, even though staging is a non-regulated industry, CSP® (Certified Staging Professional) has led the way in developing standards and a Code of Conduct. Once receiving this certification, you may list with RESA or Real Estate Staging Association and list your services. What Are the Startup Costs Involved in Becoming a Stager? Certifications and/or classes, furniture rentals or purchases, costs of moving furniture, costs for storage, business cards, a website, and marketing are all a part of the home staging business. You need to sit down and calculate how much you want to put into starting a home staging business (time and money) and how badly you want it. And as mentioned above, it may be necessary to charge some of your props and furniture starting out if you aren't able to afford it immediately. How Can You Market Yourself as a Stager? Home realtors, home appraisers, furniture stores, design stores and online staging directories are all great places to advertise and market your staging business. You can also join offline groups such as your local Chamber of Commerce and BNI. Facebook groups as well as local online listings are great places to get the word out about your services. What Are Some Perks That Go With Becoming a Stager? Getting an inside track on the real estate market. Being able to work with and learn from other professionals. Will You Need to Have a Specialty as a Stager? While you don't have to specialize, most stagers often end up doing just that based on which types of homes they are best at staging. For example, some stagers specialize in luxury homes, Cape Cods, log cabins, beach houses, etc. The types of props you collect will usually begin to reflect your specialty. As with all small businesses, do your homework first. Decide if starting a home staging business is really what you want to do and then take the necessary steps to make it happen. If you are struggling to plan your business, you can always reach out to more experienced stagers or a business planner. 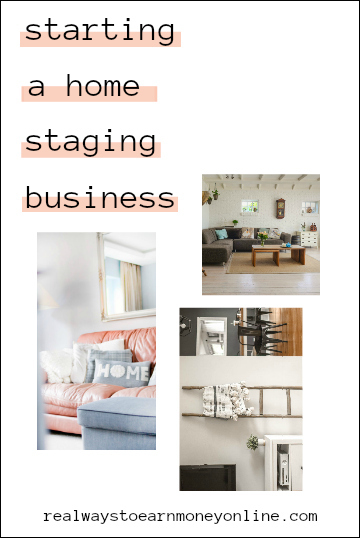 Be sure to check out this huge list of over 50 other home business ideas if you want to start a home business but don't think staging is for you.